Back after a LONG hiatus - baking is therapeutic for me! I'm just here to quickly re-introduce myself. I consider myself an intermediate baker and I have my fair share of baking toys. I've been baking in a variety of ways for the last 15 years, bread baking is one area I still want to master MORE. My return coincides with recovering from a stroke (actually two, but only one left a deficit) that I had almost a year ago. The strokes were small, but significant and for a while, I lost my ability to read and write. Reading long passages is still difficult (I tend to skip words), but I'm recovered and I shouldn't have further strokes as they discovered what caused them. I happen to have a flukish system that needs slightly higher blood pressure due to the way the blood flows through my brain and so when I started taking blood pressure medicine for the first time a year ago, it lowered it too much and too quickly for my body and caused a stroke within 3 days of starting the medicine and again 3 months later - which is when they figured out the problem. Mentally, I'm "over" the strokes, but how I was treated at work when I had the strokes will take longer for me to recover. Basically, I lost my career, so not only did I have to recover from the strokes, but I had to recover from losing a job and career I loved too. 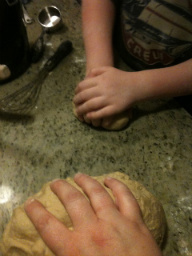 THAT has been the part that still makes me so sad, so I'm using bread baking (and baking in general) as therapy. Exercising my brain to try new things helps keep my brain sharp, so reading here, trying new things, and keep my brain flexible is all good. I don't eat much of my creations as I'm carb sensitive, but my family enjoys, so there is that too. I've been around long enough to remember you. So sorry for all the difficulties you have gone through but glad you are moving forward and finding joy. There are some delightful and knowledgeable "new" people and many of the "old" ones that are still active. If you want some new challenges, Stan Ginsberg wrote a book and has a wonderful website called "The Rye Baker" and www.theyryebaker.com . Take a look, if that suits your fancy. He also still participates here once in a while. Welcome back and bake some deliciousness! Thanks for the rec and the welcome back! I literally dusted off my old books and just ordered a new one here on the forum that is a pdf book, but I'll look up your recommendation too. i also had two small strokes only on e leaving deficits and lost the career and so forth. Mine was caused by a fib. I use my finger as a guide when I notice myself skipping the left side of the page (it randomly happens). I too love bread making sourdough to white to cinnamon swirl. It is therapeutic which isn’t judged until the final product. There is just something special in working with yeast and growing your own culture into a rustic loaf. I'm sorry it happened to you too. Ironically, for me, it might have saved me from a worse fate as it was a wake-up call to do better with my health, but to have a stroke at 48 in the peak of your career is devastating mentally. For years I thought it would be heart disease that would get me in the end as everyone in my family died of heart disease. My estranged father died at 42 of a heart attack, but I've had a bazillion tests and very quickly they determined that something was strange with this stroke as I didn't have signs of heart disease - no plaque at all. I've had so many tests and my ticker is perfect (I'm wearing an internal heart monitor too).... but the wiring of my brain is unusual it seems. So I MUST not have BP under 120/80. I'm taking this wake up call to be more adventurous. I learned to ski this winter at the age of 49 - learning at the same time as my 13-year-old and amazingly learning to do it quickly and fairly well! I've joined a trivia league that my husband has been part of for YEARS because I scared of being bad to try... well, screw that! I quit my job because it was SOOOO horrible and they were horrible to me - like HORRIBLE... so I'm job hunting and baking and decluttering my house while I have the time and I'm taking the time to enjoy life.